MCoN (Mouse Cortical Neurons) are cryopreserved primary mouse neurons derived from the cerebral cortex of day 18 embryonic CD1 mouse brains. When cultured under the recommended conditions, MCoN arborize and form complex neurite network in one week. MCoN Stain positive for β III-Tubulin. 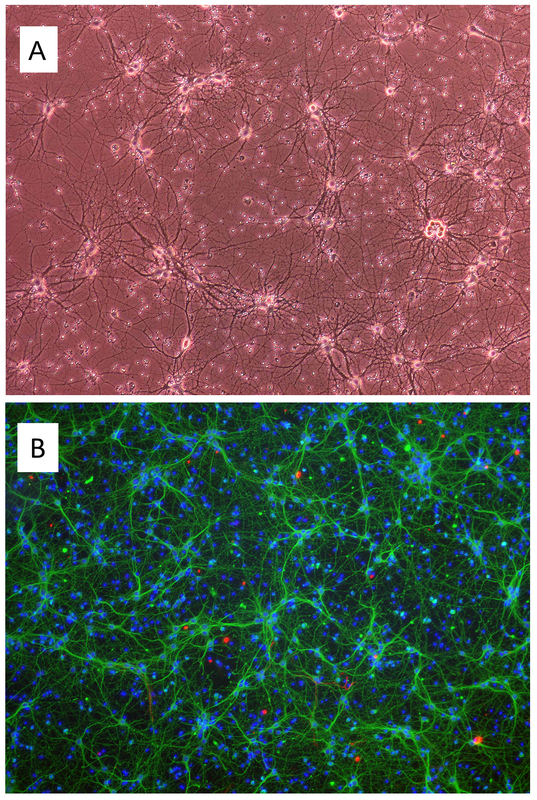 Mouse cortical neurons are available in multiple formats, including cryopreserved neurons, freshly isolated primary neurons in suspension, or pre-plated cultured neurons. The cerebral cortex plays a key role in cognition, memory, attention, perceptual awareness, thought, language and consciousness. Neurons connect to other neural cells through neurites and synapses to form complex neurocircuitry for signal transmission. A healthy circuitry in the brain is essential for cognitive functions, proper control and regulation of the other parts of the body. Dysfunction and degeneration in the cerebral cortex have been implicated in various brain injuries, neurological and psychiatric disorders. Cortical neurons, therefore, provide an excellent cellular model system to study disease mechanisms and pathophysiologies. They also serve as a platform for drug screening and development, toxicity tests, immunostaining, live cell imaging, co-culturing and electrophysiology. (Click to Enlarge) Freshly isolated Mouse Cortical Neurons (MCoN) cultured for 7 days. A: Phase contrast, 100x. B: Immunostaining for β-III Tubulin (green), GFAP (red), DAPI (blue), 100x.